Volunteers form ranks to sweep the terrace surrounding the historic Shwedagon Paya in Yangon, Unuon of Myanmar (Burma), Nov. 26, 2009. The broom brigades clean the marble terrace several times a day. 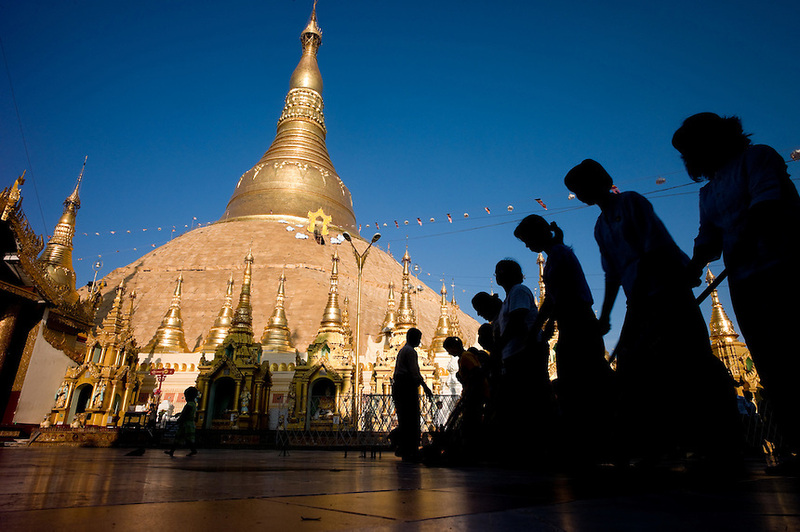 The Shwedagon pagoda's central hti, an umbrella spire atop the giant zedi structure, sports a 76-karat diamond that casts red, green white beams to specific spots on the terrace as the sun rises or sets. The massive complex sits atop a 190-foot hill accessed by four stair-stepped walkways guarded by 30-foot-tall mythical half-lion half-dragon creatures called chinthe. The central 98-foot-tall zedi is surrounded by an incredible assortment of other smaller zedi, statues and temples...EDS: Not for syndication nor redistribution. Web slide show only. Please do not strip metadata for Web use.